Background and objectives: Neurologic involvement is the most threatening complication of diarrhea-associated hemolytic uremic syndrome (D+HUS). Design, setting, participants, & measurements: We report a retrospective multicenter series of 52 patients with severe initial neurologic involvement that occurred in the course of D+HUS. Results: Verotoxigenic Escherichia coli infection was documented in 24. All except two patients had acute renal failure that required peritoneal dialysis, hemodialysis, or both techniques. A first group of eight patients remained with normal consciousness; five of them had protracted seizures. A second group of 23 patients had stuporous coma; five of these had protracted severe seizures, and 18 had a neurologic defect including pyramidal syndrome, hemiplegia or hemiparesia, and extrapyramidal syndrome. A third group of 21 patients had severe coma. Plasma exchanges were undertaken in 25 patients, 11 of whom were treated within 24 hours after the first neurologic sign; four died, two survived with severe sequelae, and five were alive without neurologic defect. Magnetic resonance imaging (MRI) for 29 patients showed that (1) every structure of the central nervous system was susceptible to involvement; (2) no correlation seemed to exist between special profile of localization on early MRI and the final prognosis; and (3) MRI did not exhibit any focal lesions in three patients. The overall prognosis of the series was marked by the death of nine patients and severe sequelae in 13. Conclusions: Neurologic involvement is associated with a severe renal disease but does not lead systematically to death or severe disability. Diarrhea-associated hemolytic uremic syndrome (D+HUS) is the main cause of acute renal failure in children who are younger than 5 years. The disease is mainly due to a gastrointestinal infection with verotoxigenic Escherichia coli and the release of verotoxins in the blood. Verotoxins are able to bind at the cell surface of endothelium, leading to the internalization of the subunit A that belongs to the ricin family of vegetal toxins. These toxins are able to inhibit protein synthesis after their release in the cytosol by removing one adenine from the 28S RNA of the 60S ribosomal subunit (1). Although renal endothelium is the main target of verotoxins in humans, extrarenal damage is frequent in D+HUS. In addition, neurologic involvement is the most threatening complication of D+HUS. Here, we report a series of 52 patients with severe initial neurologic involvement that occurred in the course of D+HUS. Among that series, nine patients died and 13 developed severe sequelae. The main demographic and clinical data are presented in Table 1 according to the severity of consciousness troubles: Patients of group 1 had a normal consciousness and a Glasgow score of 14 or 15 (2); patients of group 2 had not a normal consciousness and a Glasgow score between 9 and 13; patients of group 3 presented with severe consciousness troubles and had a Glasgow score of <9. Pyramidal syndrome was defined by a sole reflex in extension (Babinski sign), exaggerated osteotendinal hyperreflectivity, and spastic hypertonia. Extrapyramidal syndrome was defined by axial dystonia and extrapyramidal hypertonia. Patients were aged from 0.1 to 16.9 years (median 2.1 years). All except two patients had acute renal failure (Table 1) that required peritoneal dialysis (n = 23), hemodialysis (n = 18), or both techniques (n = 9) during a median duration of 12 days (range 0 to 49 days). In addition, one patient did not recover any renal function from the acute phase. Gastrointestinal prodrome featured diarrhea in 50 of 52 and only vomiting in two of 52. All patients had at least two hematologic feature of HUS (Table 2): Anemia (49 of 52 had a blood hemoglobin <10 g/dl) that required blood transfusions in 47, thrombopenia (50 of 50; data unavailable for two patients), or schistocytosis (48 of 50; data unavailable for two patients). Verotoxigenic E. coli infection was documented in 24 of 52, including one patient with isolated vomiting. None of the 43 patients who remained alive experienced recurrence of HUS. Magnetic resonance imaging (MRI) was available for 29 patients. All MRIs were performed before and after gadolinium injection. Image interpretation was performed by one radiologist who is specialized in pediatric neuroradiology. MRI findings were compared with clinical and biological data. Data are presented as median and range. A global analysis of the series shows that, at last follow-up, nine patients had died (mean age 3 years), 12 patients had severe disabilities and no longer had autonomy of life, five patients had mild sequelae, and 26 patients had fully recovered. Severe hypertension >97th percentile + 30 mmHg according to gender, age, and length was observed in seven of 45 patients. Hyperleucocytosis (Table 2) was noted in 48 of 48 patients (median 31,965/mm3; range 15,220 to 83,000/mm3). Hyponatremia (Table 2) <130 mmol/L was observed in 23 patients, but severe hyponatremia <120 mmol/L occurred in only three patients. Other biologic parameters are presented in Table 2 and show increased C-reactive protein (CRP; normal value ≤12 mg/L) in three of 41 patients, low plasma protides (normal values 55 to 70 g/L) in 44 of 49 patients, low serum albumin (normal values 35 to 45 g/L) in 27 of 28 patients, high plasma aspartate aminotransferase (normal value <45 U/L) in 41 of 44 patients, and high plasma alanine aminotransferase (normal value <45 U/L) in 35 of 44 patients. The most frequent neurologic signs were alteration in consciousness (44 patients), seizures (37 patients), pyramidal syndrome (27 patients), and extrapyramidal syndrome with hypertonia (22 patients). Twelve patients displayed coma and seizures in addition to pyramidal and extrapyramidal syndromes. More limited neurologic defects included diplopia, dysphasia, and facial palsy. A first group of eight patients (five girls and three boys) remained with normal consciousness, five with subintrant seizures that lasted for >24 hours, including two who secondarily needed mechanical ventilation as a result of a high dosage of antiepileptic drugs. Of the eight patients, six had a neurologic defect including pyramidal syndrome in four with hemiplegia in two and extrapyramidal signs in two. All patients were alive at last follow-up. Significant neurologic sequelae consisted of hemiparesia in two and epilepsy in one. Other extrarenal involvement included transient diabetes (n = 1), mild pancreatitis (n = 2), and transient myocardial dysfunction (n = 1). Of the eight patients, six needed dialysis for a mean duration of 15 days (creatinine at last follow-up 83 μmol/L; range 26 to 350 μmol/L), and one definitely progressed to end stage renal failure. A second group of 23 patients (eight girls and 15 boys) had stuporous coma. Five patients had protracted severe seizures. Eighteen patients had a neurologic defect including pyramidal syndrome in 11 with hemiplegia or hemiparesia in three and extrapyramidal syndrome in seven. All but two patients were alive at last follow-up. Significant neurologic sequelae consisted of residual paresia in three patients, epilepsy in one, and developmental delay in one. Other extrarenal damages included diabetes (n = 1), pancreatitis (n = 5), perforating colitis (n = 3), and transient myocardial dysfunction (n = 1). All but one patient underwent dialysis for a mean duration of 12 days (median of serum creatinine at last follow-up 69 μmol/L; range 27 to 203 μmol/L). A third group of 21 patients had severe coma that needed mechanical ventilation (median of duration 10 days; range 1 to 34 days). Six patients had severe protracted seizures. Neurologic defects consisted of pyramidal syndrome in 12 and extrapyramidal syndrome in 13. Fourteen patients were alive at last follow-up. Five patients had severe disabilities and needed to be admitted to specialized institutions for severe neurologic disability. Other extrarenal damages included diabetes (n = 1), pancreatitis (n = 4), angiocholitis (n = 1), and transient myocardial dysfunction (n = 1). All patients needed dialysis for a mean duration of 15 days, but all recovered renal function (median of serum creatinine at last follow-up 58 μmol/L; range 27 to 230 μmol/L). Of note, three patients from group 2 (patients 10, 26, and 29) and three from group 3 (patients 34, 46, and 49) with seizures associated with pyramidal and extrapyramidal syndromes fully recovered without neurologic sequelae. 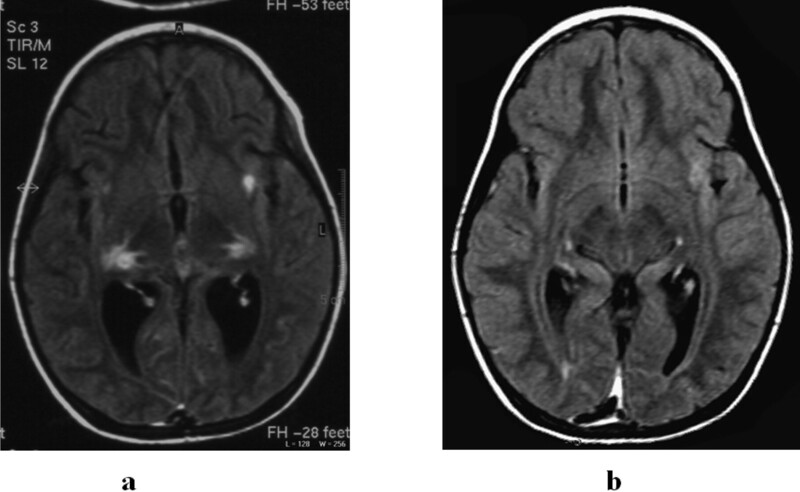 Figures 1 and 2 show the diffuse brain damage on the initial MRI of patient 49 and the remaining damage by 6 months. Patient 49 finally had fully recovered normal color vision at last follow-up. Patient 49: MRI findings at day 3 in a 3-year-old girl with severe coma, pyramidal and extrapyramidal symptoms, and cortical blindness suspected on day 15 of evolution. (a and b) Fluid-attenuated inversion recovery axial view on the third day after admission shows bilateral and symmetrical high-intensity signal in the lateral geniculate bodies (1), posterior limbs of internal capsule (3), thalamus (4), and medial occipital cortex (5) as well as temporal insulae (2), including external capsule, claustrum, and extreme capsule. (c) Diffusion-weighted imaging shows hypersignal in lateral the geniculate bodies (1) and insulae (2), only areas demonstrating a restricted diffusion as a result of cytotoxic edema. (d) Noncontrast coronal T1-weighted view shows a spontaneous hyperintense signal in the lateral geniculate bodies (1), probably as a result of hemorrhage. Patient 49: MRI findings at day 15 (a) and 6 months later (b). (a and b) Fluid-attenuated inversion recovery axial view. At day 15 (a), hypersignal persists only in the previous restricted diffusion areas. Six months later (b), slight hypersignal in the left insula and the geniculate bodies is still visible (the child had at that time disturbed color vision). Plasma therapy was undertaken for 29 patients (four of eight in group 1, nine of 23 in group 2, and 16 of 21 in group 3). Plasma infusion was administered to four patients, and plasma exchanges were conducted for 25. The mean delay between the onset of neurologic symptoms and plasma exchange was 3.6 days. Of the 25 patients that underwent plasma exchanges, 11 were treated within 24 hours after the first neurologic sign; four died, two survived with severe sequelae, and five were alive without neurologic defect. The outcome of this group of 11 patients (belonging to groups 2 and 3) was significantly different from neither the patients in group 2 or 3 who were not treated with plasma exchange nor the rest (group 2 and 3) of the series (bilateral Fisher exact test). Results from 29 MRIs are detailed in Table 3. Early MRI of the central nervous system (CNS) was performed during the acute phase within 10 days after the first neurologic sign of the disease in 17 patients. As a matter of fact, MRI analysis of this series of 29 showed that (1) every structure of the CNS was susceptible to involvement, (2) damage seemed to be randomly localized according to individuals, and no special profile of localization on early MRI had a particular correlation with the final prognosis in terms of lethality and neurologic sequelae; diffuse damage to several substructures of the CNS frequently led to death (patients 11, 14, 33, 37, and 43) or severe disabilities (patient 51), but complete recovery without any sequelae (see Figures 1 and 2 for patient 49) was also observed in two patients (patients 15 and 49); (3) hemorrhagic lesions were observed in five patients (patients 3, 11, 14, 29, and 36), two of whom died and two of whom fully recovered without any sequelae; and (4) MRI performed by days 1 (patient 38), 4 (patient 5), and 26 (patient 27) strikingly did not exhibit any focal lesions in three patients despite clinical pyramidal syndrome or severe coma. The use of gadolinium did not lead to nephrogenic systemic fibrosis in survivors. This series of 52 patients with D+HUS and severe neurologic involvement is the most important ever reported in the literature. The most frequent clinical features of neurologic damage were coma, seizures, and pyramidal and extrapyramidal syndromes. Neurologic complications of HUS led to death in 17% of patients and to severe sequelae in 23%. Conversely, 50% of patients remained alive and had a complete neurologic recovery. The most frequent cause of HUS in European children is the gastrointestinal infection with verotoxigenic E. coli. Other causes include pneumococcal infections and genetic forms secondary to gene alterations in complement regulators and are far more infrequent. In our series, verotoxins or verotoxigenic strains of E. coli were identified in approximately 50% of patients. The second half of the patients with D+HUS are highly suspected of gastrointestinal infection with verotoxigenic E. coli (1) because of the acute presentation of HUS, (2) because of the lack of recurrence in patients who remained alive, (3) because all patients were living in France and did not have exposure to Shigella dysenteriae type 1, and (4) because of the rarity of genetic forms of HUS. Nevertheless, severe forms of D+HUS were associated with mutation of complement regulators in two reports, suggesting that a special genetic background may sensitize children who are infected with veritoxogenic strains of E. coli to acute D+HUS, in particular to severe forms and complications (3,4). Severe neurologic involvement is not rare in D+HUS. A search for D+HUS with neurologic involvement in the literature resulted in retrieval of seven series that totaled approximately 150 patients (5–11). The French national survey of D+HUS numbered 1308 cases between 1993 and 2007, and our patients, who were recruited from the same centers that participate to the French survey, include 39 cases in the same period, suggesting that the frequency of neurologic involvement is approximately 3%. This prevalence is significantly lower than those estimated in the seven series reported in the literature, but one should keep in mind that (1) the figures given by the French national survey are reliable, (2) our series is supposed to be complete because every pediatric nephrology unit has been directly and individually contacted for this series, and (3) isolated seizures were excluded from our series. The prognosis of neurologic involvement in our series was intermediate among the three most important series (6,8,11) and those of Hahn et al. (10). The age of patients who died or continued to have severe disabilities was not significantly lower compared with patients who fully recovered in our series as well in all series of the literature. As already reported in the literature, most patients of our series had high levels of white blood cell, CRP and, alanine aminotransferase and low levels of sodium and total protein (12–14). The mechanisms of damage in the CNS are frequently considered to be due to multiple factors, including local microangiopathy, hypertension, and hyponatremia (6). Recent advances showed that verotoxin receptor Gb3 is not expressed in neurons and glial cells. Subsequently, verotoxins may not directly damage neural cells, whereas neuroinflammation through massive cytokine release may play a critical role in apoptosis of neural cells (15,16). The severity of neuroinflammation may be represented by hyperleucocytosis and increased plasma levels of CRP. 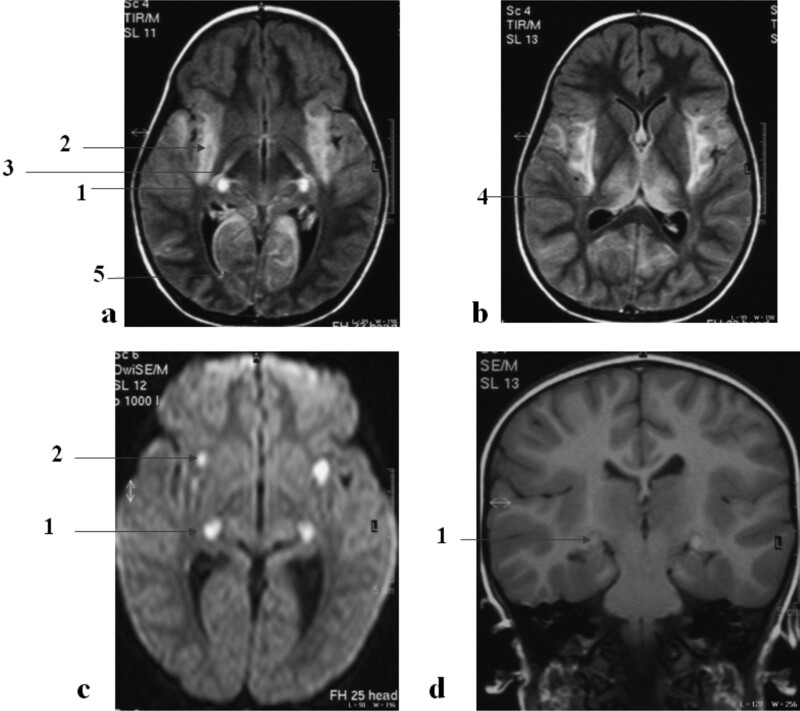 In a series of 64 autopsied children with D+HUS, the brain was examined in 32 and showed microangiopathy in 11 and hemorrhages in 21, suggesting that the main cause of damage is a parenchymal ischemia that is directly due to the cerebral localization of microangiopathy (7). Our series shows that a threatening level of hypertension at onset of neurologic signs is relatively infrequent and that only three patients had severe hyponatremia susceptible to leading directly to cerebral damage. By contrast, most but not all MRI examinations showed features of parenchymal ischemia or hemorrhages. Thrombotic occlusion that affected either carotids or vertebral arteries as well as territorial infarction, evoking cerebral artery occlusion, was not observed here and has never been described elsewhere. Consistently, the analysis of MRIs of our series showed random localization of parenchymal damage without any systematization. Similar to the cases reported in the literature (5,17–21), we were unable to find any specific profile of damage localization that could predict patients’ outcome. Consequently, the interest of MRI is limited to checking the localization of parenchymal damage in patients and especially in those with stupor and coma, in whom clinical examination lacks of accuracy. It is interesting that three patients in our series had normal or subnormal MRIs despite isolated pyramidal syndrome or stupor with or without pyramidal syndrome. Only one of these patients had severe hypertension, and the other two had normal sodium and normal BP. Sequelae were limited to epilepsy in only one of these three patients. Similar findings have been reported in the literature (5) and remained unexplained. By contrast, of genetic forms of HUS that are due to complement regulators and to thrombocytopathic thrombocytopenic purpura as a result of ADAMTS13 deficiency or autoimmunity, data on plasma therapy and plasma exchange in severe forms of D+HUS with extrarenal complications are scarce in the literature (22). A multicenter, controlled trial of plasma infusion was completed in France more than 20 years ago and concluded a beneficial effect, especially in the prevention of cortical necrosis (23). Treatment with plasma exchange has been reported in several single cases and in one series without a clear-cut conclusion (7,24–27). For half of the studied patients, we could not find direct benefits of plasma exchange, even when started a few hours after the onset of neurologic complications; however, this does not exclude clinical benefits of plasma exchange, because complications might have been even worse if plasma exchange had not been performed. This study does not allow any definite conclusion on the efficacy of plasma exchange for patients who have D+HUS with CNS involvement. The prognosis of neurologic complications of D+HUS are not systematically associated with death or severe neurologic disability. The prognosis is not related to a special localization of damage in the CNS but to the general severity of the disease: Nearly all patients with neurologic involvement had severe renal damage and required dialysis. We sincerely thank Odile Boesfplug-Tanguy for useful help in the retrospective analysis of neurologic symptoms and Brigitte Llanas for additional data collection.